DF-Fencing. Fencing Contractors Scotland. About Us. We are a family run business based in rural Perthshire. 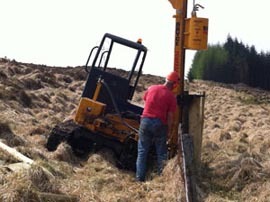 Specialising in Agricultural, Forestry, equine & Domestic fencing all over Scotland. Having over 25 years experience of fence erection & repairs, you can trust in us for all your fencing requirements, large or small. The company is headed up by Duncan Fisher. Coming from a hill farming family, Duncan has a wealth of fencing experience having erected & maintained the stock fences on his own farm and also for many Perthshire & Argyll Estates and hill farms for over 25 years. Deer fencing is a major part of our business. The Forestry Commission in Scotland are a prestigious client of ours and we carry out approx 50,000 metres of deer & stock fencing for the commission every year as part of recent major fencing programme in Perthshire, Tayside, West Argyll, Lochaber, North Highlands, Aberdeenshire & Galloway. We also carry out contracts for other Forest Management companies such as Scottish Woodlands, Land Management companies such as Bell Ingram & Savills and major Rail Infrastructure Contractor QTS Group . We pride ourselves in the quality & delivery of our work. We have an experienced, skilled & hardworking group of contractors who carry our contracts. They are all fencing contractors that Duncan has known for many years or have been highly recommended to us. The environment is very important to us. We use FSC mixed source materials that supports the development of responsible forest management. Our main material supplier is another Perthshire company, Tornado Wire from Crieff and have enjoyed a great relationship with them for many years now. They fully understand our customers requirements on quality & delivery of service and are able to help us deliver on both accounts. “To be a leading provider of sustainable fencing solutions to agricultural, forestry, equine & domestic customers. Offering quality service whilst ensuring minimal impact on our environment”.